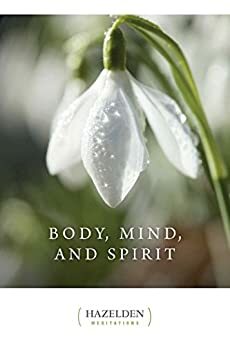 Written with warmth and understanding, this daily meditation book for those in recovery offers thoughtful and supportive advice for healing the whole person--body, mind, and spirit. We are more than our addictions. While walking the path of recovery from drugs and alcohol, it is easy to neglect the other aspects of our lives and health. Drawing on the words of poets, philosophers, scholars, and people living everyday lives of recovery, Body, Mind, and Spirit weaves together the wisdom of time and experience. Through daily quotes, thoughts, and affirmations on the issues encountered in recovery, this book offers practical advice on making positive choices for healing spiritually, mentally, and physically. No matter what stage of recovery you are in, Body, Mind, and Spirit will provide inspiration and support day by day. Daily readings have helped me spiritually grow. Found this one to me a good one!!! Whether the alcoholic or a family member you will find this a helpful read! I have read several daily meditation books, but this is the one that makes me feel healing the most. I am so glad that I purchased this. 5.0 颗星，最多 5 颗星Great daily read! This tiny book packs a powerful punch! Great wisdom, reflections and perceptions. And...it's a quick 2 minute read. Yeah for this nugget!